OH! SHE KNOWS A BIT. Copyright, 1894, by Spaulding A Gray. Words and Music by Felix McGlennon. If the maiden says, "I'd rather not-at least-well, not at night,"
Oh, she knows a bit-yes, she knows a bit. I don't think it is judicious for a girl to stop out late,"
Well, it's good to know a little now and then. 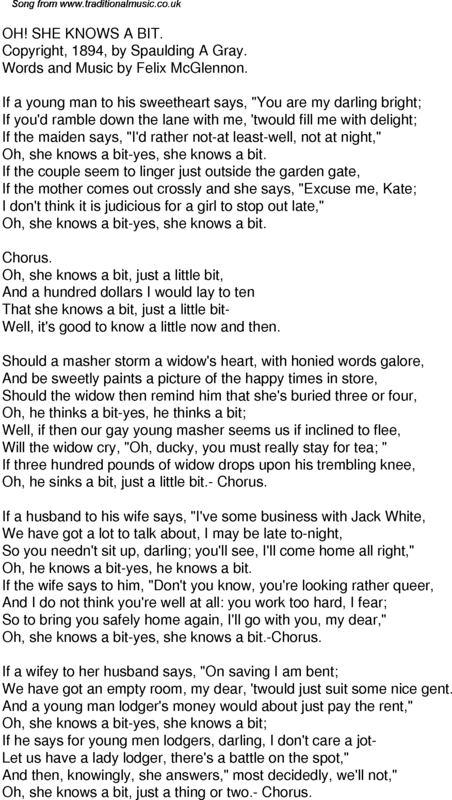 Will the widow cry, "Oh, ducky, you must really stay for tea; "
Oh, he sinks a bit, just a little bit.- Chorus. So you needn't sit up, darling; you'll see, I'll come home all right,"
Oh, he knows a bit-yes, he knows a bit. So to bring you safely home again, I'll go with you, my dear,"
Oh, she knows a bit-yes, she knows a bit.-Chorus. We have got an empty room, my dear, 'twould just suit some nice gent. And a young man lodger's money would about just pay the rent,"
Let us have a lady lodger, there's a battle on the spot,"
And then, knowingly, she answers," most decidedly, we'll not,"
Oh, she knows a bit, just a thing or two.- Chorus.